Breweries have watched beer drinkers defect to cheaper brews in recent years, but now they are beginning to see a small but growing group of consumers willing to pay more for premium beers. Sapporo Breweries Ltd. said Thursday it will release a limited batch of premium beer on March 15. 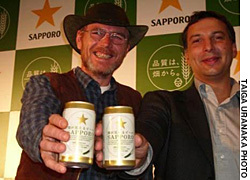 Sapporo Hatake ga Mieru beer uses only barley and hops from 118 German farmers directly contracted by the brewery. Company officials said retailers will probably sell the beer for a price somewhere between its high-end Yebisu, which averages about 233 yen for a 350-ml can, and Black Label, which goes for around 218 yen per can. The company said it expects the beer to do well in the growing premium-beer market. 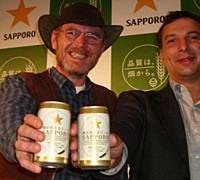 “One thing I can say about the beer market today is there is a greater polarization” of customers, said Sapporo President Masaru Fukunaga, citing the sharp growth of both cheap beerlike beverages and pricey high-end beers. According to industry figures, the country’s beer market last year saw a sharp jump of so-called third-category beer, which do not contain malt and are thus subject to a lower liquor tax. The segment has tripled in size since last year and now accounts for some 16 percent of the total market. Meanwhile, beer sales have continued to shrink, dropping 8 percent year-on-year in 2005. But the popularity of premium beers is growing, even though the total volume is small compared with their mainstream siblings. Yebisu grew 1 percent last year. Suntory Ltd.’s Premium Malt’s sold more than double in 2005 compared with the prior year and the firm is confident it will see four-fold growth this year.